Two-time runner-up Ali Carter says his sole focus is winning the World Championship after beating Scot Alan McManus in a tricky first-round match. Englishman Carter, 35, whose world ranking of 13 was protected while he twice fought cancer, led 6-3 overnight and secured a 10-5 win. 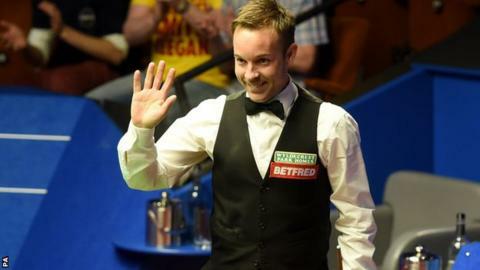 "I am here to win it," said Carter, who faces 2010 winner Neil Robertson on Saturday. "I don't care who I play. "I have good memories at the Crucible. The thing I have left is to win it." The Essex player, who was given the all-clear from lung cancer in December, was always in control after taking the potentially crucial opening frame of the afternoon with two breaks in excess of 50. He had been diagnosed with a cancerous tumour on his lung last summer, having already recovered from testicular cancer. McManus, who made his Crucible debut in 1991, gave an industrious display, but Carter was never in serious trouble and showed signs of his fluent best to record a comfortable victory on his 13th World Championship appearance. The three-time ranking event winner said: "I don't feel like I played that great but I competed in all departments and played all right and there's plenty left in the tank. "I won quite convincingly and considering I have not had many matches this season I am pleased with the way I held myself together." "It was great," he said. "When you walk down the stairs it is brilliant to be back and playing but I was focusing on winning the match. "I didn't want to come here, get good applause, play like an idiot and go home. "All the other tournaments are not in the same ballpark as the World Championship. The World Championship is totally unique. "Alan has been playing all season and is match sharp and I have hardly played in anything. "But out there at the Crucible is a totally different pressure and that's where I feel comfortable and where I enjoy playing snooker the most."